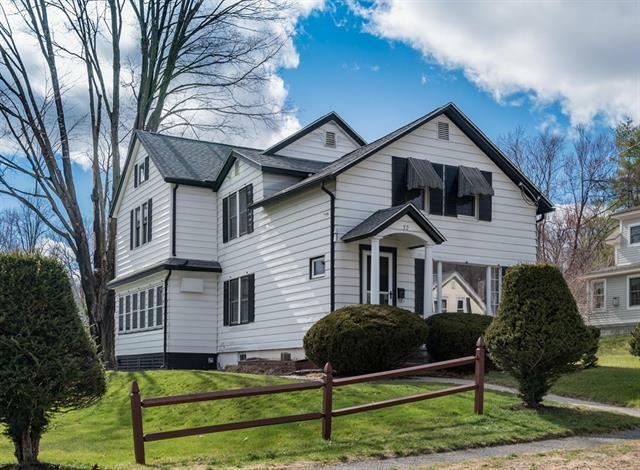 According the the MLSPIN (Pioneer Valley chapter of MLS), there were 61 single family homes listed for sale between March 1st and May 1st of 2016 alone. Here we are in mid April of 2017, and there are only 45 single family homes on the market in Northampton. Some of these are new construction opportunities, and some are already under agreement. Agents within our office have anecdotes of packed open houses, with multiple offers being submitted and buyers being outbid on the few houses that have come on the market this spring. This article from realestate.boston.com confirms that housing inventory in Massachusetts is at an all-time low. 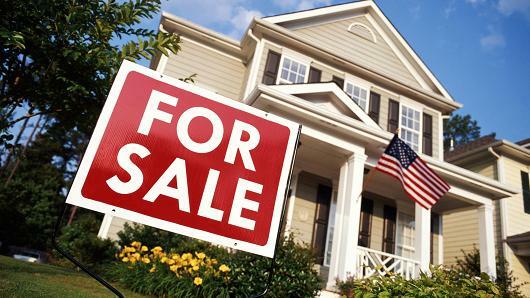 Whatever the factors are behind the dearth of new single-family listings - the fact is that now is a great time to sell! Buyers are eager to buy, interest rates are still low. So, if you are a seller thinking about possibly selling your home - the first step is to reach out to your agent to find out what our opinion of market value would be. There is no question that the demand is high, and many houses are selling for above asking price in this climate. Contact us today to set up your comparative market analysis! As an admitted design junkie, those of you who have read my blog before know that I am a huge fan of the Apartment Therapy website and blog. A good friend of mine, who has an amazing eye for design, recently traveled to Amsterdam. When she came back, she told me she intended to paint all of the woodwork on her windows black, like many of the houses she saw during her travels. This is a woman who means business. When she has a vision, she makes it happen. I was curious about this trend, and whether it would appeal to me as well. 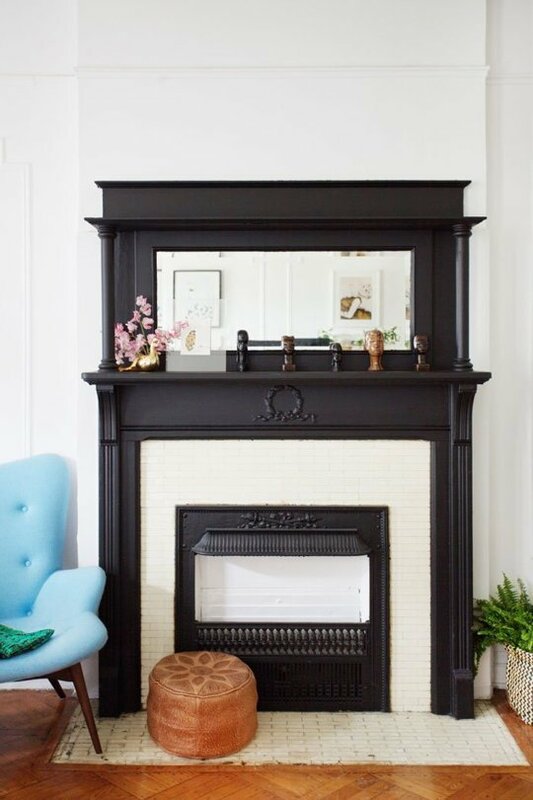 I happened upon this story on Apartment Therapy which makes the use of black paint as an accent look extremely appealing! I think the key is to choose one element in a room, which will make the rest of the room "pop". As realtors, we here at Maple + Main Realty see trends come and go with some frequency. Paint is a great way to update a space without commiting to a large, expensive renovation. In addition, paint can be painted over if you tire of the look! 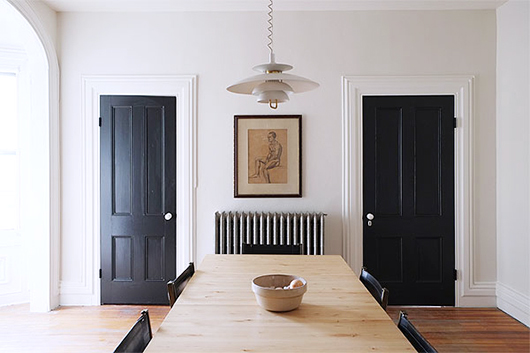 And a fun trend such as limited use of black paint can freshen up a space and make it look as if you have done more extensive work than you have. There's a reason black is a classic: it's dark, it's beautiful, it matches with almost everything. And it's a great way to add a little contrast, drama and depth to an interior that needs a little extra pizazz. Here are seven weekend painting projects that will add a little bit of black -- and a whole lot of style -- to your home. 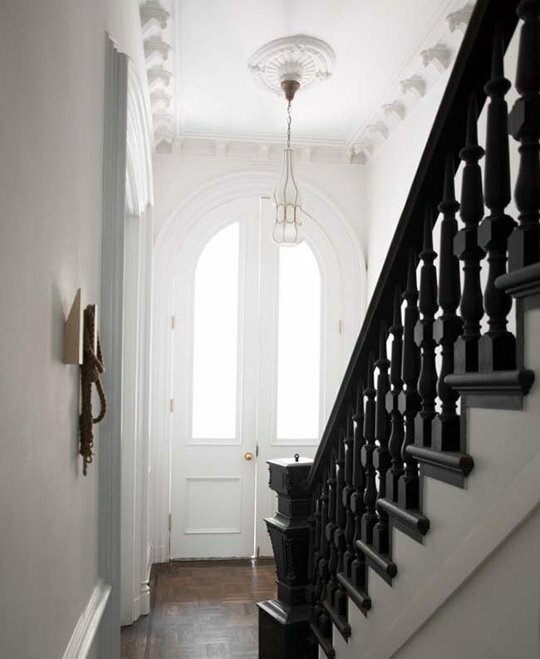 Paint just the railing, or just the stairs, or both for a little extra impact. Add instant class to any space, without the trouble of painting a whole room. 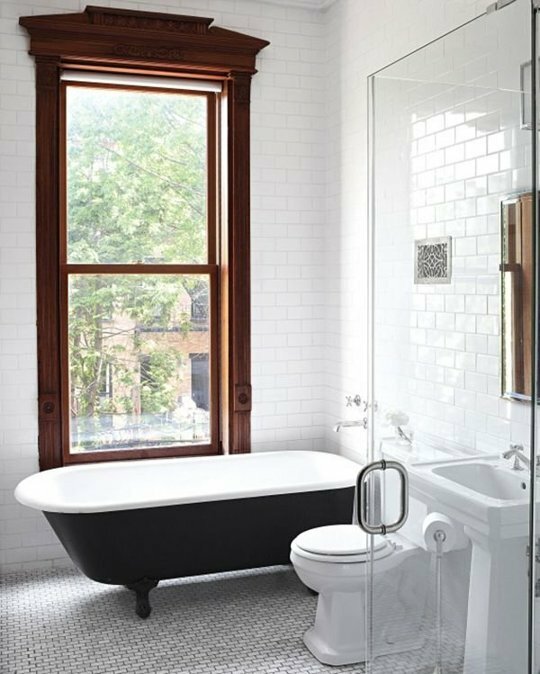 If you have an old cast iron tub, painting the outside is a great way to refresh your bathroom without remodeling. Ohmega Salvage has a great guide to this. 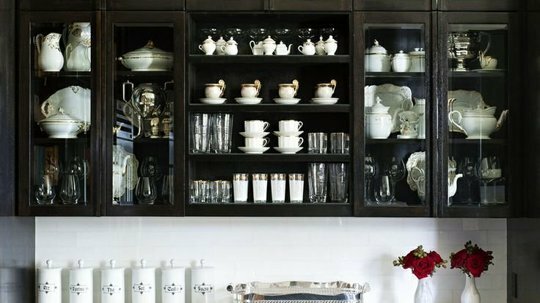 Try just the upper cabinets, just the lower cabinets (the two-tone look is in) or go for broke and paint them all. Give the focal point of the room a little extra oomph. 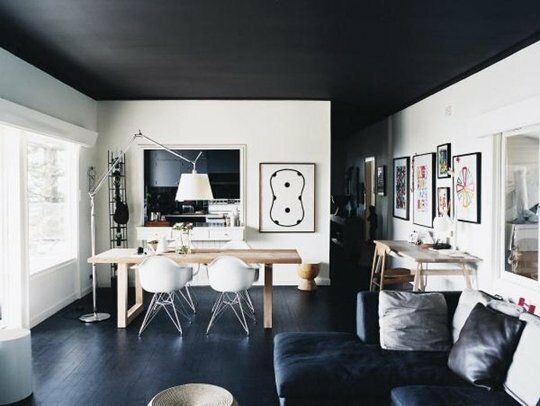 Painting your ceiling black is a bold choice that can make a large room seem cozier, and will make any room much more dramatic. 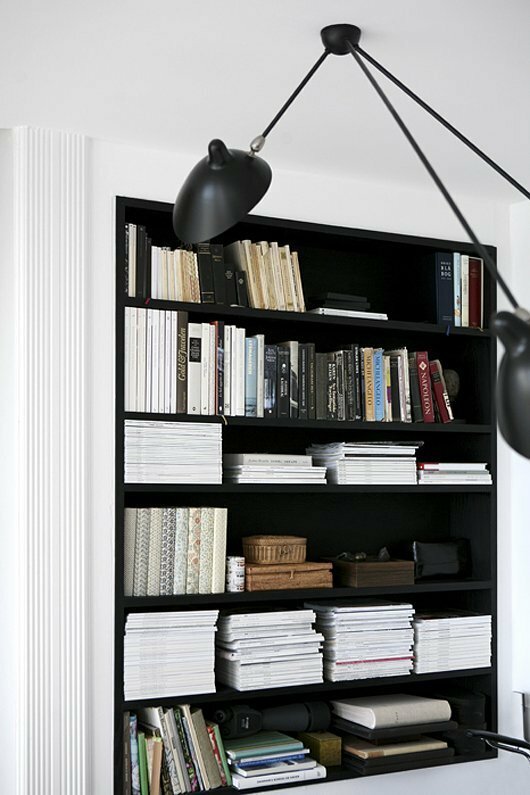 If you love your bookcases, painting them black is a great way to set them off -- and draw attention to all those lovely volumes. 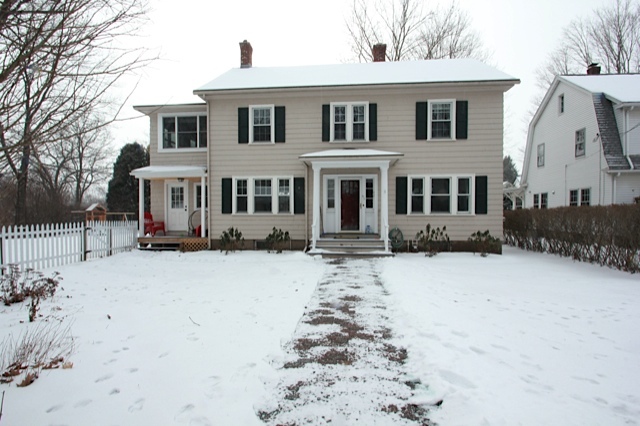 Low Inventory of Houses for sale in the Pioneer Valley? The Daily Hampshire Gazette, our local Northampton, MA newspaper, ran an interesting article this week about the dearth of inventory of homes for sale in the Pioneer Valley. The article suggests that homeowners are staying put, vs. downsizing or retiring and moving, as a contributing factor to the low inventory of homes for sale. The article also points out that while there may be low inventory of houses on the market, it's a very good time to buy, as mortgage interest rates remain low. A quick check of the MLSPIN (Multiple Listing Service Property Information Network) - the MLS database for Western MA, today shows 69 homes for sale in the $200,000 to $500,000 range in Amherst, Northampton and Easthampton; and 29 listings in the $505,000 to $1,500,000 range in the same 3 communities. On a micro level, what we realtors at Maple and Main tend to see, is that the majority of buyers we work with are looking to buy in the under $500,000 range, but within walking distance to town. The problem is that houses which fit that description are few and far between. While you may find a house that is within the under $500K price range and close to town (whether it be Northampton, Florence or another local community), it will often need some TLC, have a small yard, be on a busy road - or have some other perceived negatives. Once the spring market becomes active, we do tend to see a great deal of foot traffic at our open houses -- as if buyers have been waiting in the wings for inventory to hit the market. The article also states that it pays to be ready to go, so that you can take immediate action when the house you are looking for becomes available. This means being prequalified with a (local) bank so that you can make a competing offer right away. And to have a buyer agent with whom you are working, so that you can monitor the MLS together, and be ready to see houses as they become available. For the full article, read on below. NORTHAMPTON — The buzz words that have always made the Valley’s housing market attractive — stability and steady growth — remain the same in 2016, but experts are sounding an alarm over another phenomenon that is pulling the market down. There simply aren’t enough homes for sale, said Rick Sawicki, owner/manager of Sawicki Real Estate in Amherst and 2016 president elect of the Real Estate Association of the Pioneer Valley. Sawicki believes the market has bounced back to where it was in 2007 and 2008 before the recession that slashed housing prices. But due to pent up demand, the houses that are going on the market are being quickly snatched up, he said. This is good news for sellers looking to unload their homes quickly, though prices have yet to bounce back to pre-Recession levels. The good news for buyers is that interest rates remain at historic lows, but they’ll have to act fast to snare their dream home. At the market’s peak in the spring of 2008, for example, there were about 130 houses for sale in the Amherst area. The average over the past several years has been 70 for sale. Now there are 38 houses on the market, he said. In 2014, 1,062 houses were sold in Hampshire County and that number increased 17 percent in 2015 to 1,242, according to statistics compiled by the Massachusetts Association of Realtors. The median price of homes sold in the county dropped slightly in 2015, to around $257,000 compared to $260,000 from the year before. Hampshire County is lucky because it has the five colleges, Sawicki said. 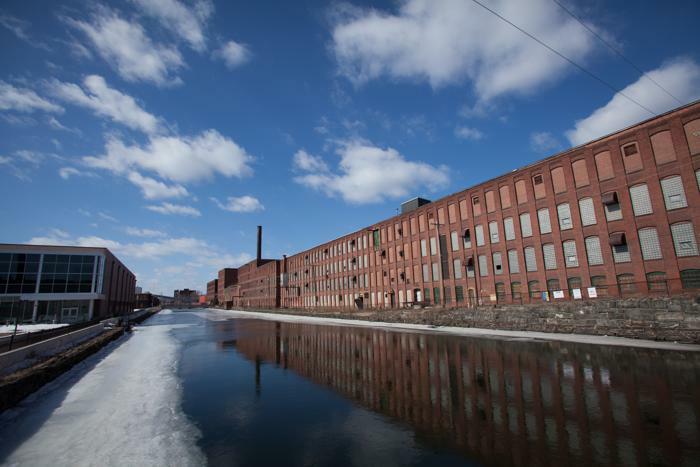 Unlike in other states where residents can depend on factories that might close or move overseas, the University of Massachusetts and the other institutes of higher learning are stable, he said. The region has slow years when UMass has hiring freezes, but then will have great years when the university expands, he said. “The plus side for us is that they are not going anywhere,” he said. Sawicki said he and other Realtors are just now starting to figure out why there have not been as many homes for sale. People are staying in their homes longer rather than downsizing due to drops in housing prices. People are also working for more years rather than retiring, he said. Additionally, would-be first-time owners are saddled with college debt, which has become a centerpiece of the presidential campaign on the Democratic side, he said. That means some live with their parents, giving further incentive for their parents to keep their larger home. Sawicki hopes this isn’t the new reality. “We don’t see as many first-time home buyers,” he said. In prior years before the recession, Sawicki said about a third of his customers were buying their first home. At the moment, he said he does not have any. Craig Della Penna of Murphy Realtors said at his Florence office earlier this month that the key to the Valley’s stability in this market is its connection to walkable downtown areas. According to Della Penna, historic neighborhoods featuring grid-pattern streets, sidewalks and porches are the ones that are resilient and popular. He said living in the communities of the Valley brings out civic engagement in people, and residents find themselves more invested in their neighborhoods. “That means joining thankless long hours on boards and commissions here in the city as a volunteer, or they will participate in ways they probably didn’t where they used to live,” he said. Della Penna’s specialty is selling houses near conservation land, particularly near bicycle trails that have been converted from old railroad tracks. He believes that such trails have the power to revitalize neighborhoods. As for the recession, Della Penna said he knew the region had moved beyond it shortly after the 2012 election. Sixty prospective buyers came to an open house the following month in a Florence location. “Realtors that were experienced around here, we knew we were out of the recession,” he said. Della Penna had 25 sales in the past year, he said. At the same time, his business skews toward the higher end houses, meaning that he has not sold to as many first-time buyers. He described the market as a seller’s market, meaning that those selling homes have the upper hand over those buying them. Though they have to act fast, buyers can still take advantage of historically low interest rates despite a recent rate hike approved by the Federal Reserve. Florence Savings Bank offers a 3.75 percent 30-year mortgage. She said she does not expect rates to rapidly increase any time soon. “I don’t think the state of the economy can sustain that,” she said. DeLoria said the bank determines a potential buyer’s debt-to-income ratio to decide what amount they can afford to borrow. By prequalifying a customer in this way, it gives that customer the knowledge of what they can afford and the power to negotiate, she said. Mortgages are on the rise in the area. Florence Savings, for example, in 2014 approved 400 mortgages, and in 2015 the number was 523, according to DeLoria. Countywide, the value of all mortgages rose about 17 percent — from $667 million to $782 million — keeping up with the increase in home sales, according to DeLoria. Realtor Rachel Simpson of Goggins Real Estate based in Northampton is waiting for the spring. In the winter of 2014, sales were down because of the cold and snowy weather, and then the market picked up in the spring, as it always does, she said. Up until some recent snowstorms, the market remained active, but it is slow due to a lack of houses on the market. “There’s a lot of buyers looking for inventory and there isn’t much inventory,” she said. The hottest time of the market is the spring, and for that reason many prospective sellers and buyers wait until then to become active in the market. At the same time, preparing to buy or sell can take time, so Simpson is advising sellers to start cleaning their house and preparing it for showings and buyers to go out and look at some homes. Simpson said with online listings there is a lot of cursory information available, but that nothing replaces going to see a house in person. The Pioneer Valley has some of the hottest real estate markets in the Bay State! Great news for homeowners in the Pioneer Valley! According to this article on the Boston.com website, home sales in the Bay State in 2015 indicate that of the 25 "hottest" cities, we are cornering the market! East Longmeadow, Westfield, Holyoke and Easthampton all make this list! This means that house sales have increased significantly in each of these four local communities, all within striking distance of Northampton, since 2014. We Maple and Main realtors have certainly noticed this trend first-hand. Easthampton alone showed vigorous home sale activity during our busy Spring/Summer market of 2015. We look forward to a continuation of this trend in Hampshire, Hampden and Franklin counties in 2016 and beyond! It was a big year for home sales in the Bay State. The recent 2015 Massachusetts Housing Report from Waltham-based Lamacchia Realty points out that 83,961 homes sold in the state last year, a 9 percent increase from 2014. The average sale price of these homes also went up 3.6 percent. Lamacchia Realty attributes this increase in sales to factors such as loosening mortage guidelines, low interest rates, increased home equity, and an overall stronger local economy. But of the 351 cities and towns in Massachusetts, some saw the number of home sales increase more than others. As Anthony Lamacchia of Lamacchia Realty notes in his most recent report about the hottest housing markets of 2015, when a town or city sees a big jump in home sales from one year to another, it’s a strong indicator that it is “becoming a sought-after location for homeowners”—in other words, a “hot” market. This could also be an indicator for what we can expect to see in these cities and towns throughout 2016. Local, Northampton MA, finance writer, Ilana Polyak, recently wrote the following article for CNBC.com, and interviewed our very own co-owner/manager of Maple and Main Realty LLC, Julie Held for the article! Although real estate transactions are handled differently from region to region - this article has many salient points for local buyers and sellers alike. Read on for some solid advice on buying or selling a home! There have been rumblings for years from the Federal Reserve that interest rates are going to rise. But so far that hasn't quelled homebuying activity. Median existing single-family homes clocked in at $229,400 in the second quarter of 2015, up from $177,000 in 2012, a rise of more than 29 percent. In some markets, such as New York and San Francisco, prices have climbed much faster than the national averages, due to a supply-and-demand imbalance. That means buyers must do their due diligence and be in good financial shape before showing up at an open house; otherwise, it's likely they'll lose out to others more prepared to make a solid offer. To navigate this often complicated and stressful process, here's what both buyers and sellers need to know about homebuying. Are you mortgage-ready? Banks' willingness to lend money ebbs and flows with the economy, said Las Vegas Realtor Linda Rheinberger, regional vice president of the National Association of Realtors. "The pendulum is swinging," she said. To be sure, borrowers with a credit score of 760 or higher (850 is the highest score) get the best interest rates. On a $300,000 mortgage, top borrowers would pay about $100 less per month than those with a score between 660 and 679, according to Fair Isaac, a credit score company. If your credit score isn't up to snuff, take some time to fix it before you start home shopping. "You can turn your credit around in six months," said Linda Ferrari, a Los Angeles real estate broker and author of "The Big Score: Getting It and Keeping It." "If there are a lot of challenges," she added, "it might take a year." Start by getting a copy of your credit report, Ferrari said. First, look for any errors and correct them. Second, pay down some debt. You can improve your score quickly by keeping the amount of money you owe to less than 25 percent of the credit you have available. That could boost your score by 25 points, Ferrari said. Preapproval: a must-have. In a hot real estate market, a mortgage preapproval can make all the difference between winning a bid or not. "If there are multiple buyers, you want the seller to know that you know what it takes to get this deal done," said Jeff Goodman, a New York-based real estate agent with Halstead Property. And if yours is the only offer on the table, a preapproval might help you snag a property for less than asking price, Goodman said. It signals that you've done most of the legwork already and there aren't likely to be delays. "In real estate, time kills deals," he said. What's more, preapproval tells you how much you can borrow, explained Julie Held, co-owner and broker of Maple and Main Realty in Northampton, Mass.. "Otherwise, you may be looking at completely the wrong price range," she said. It's important to know the difference between preapproval and prequalification, which people often use interchangeably. They're different. Prequalification is an estimate of how much you can borrow. A prequalification may or may not affect your credit. It all depends on whether a lender checks credit reports during this stage and how often you apply. Preapproval goes a step further and analyzes your creditworthiness. After that, all that's left for the lender is to evaluate the property you wish to buy. Down payments and closing costs. How much to put down for a down payment varies by market and by property type. "Twenty percent is ideal in order to avoid private mortgage insurance," Held said. Private mortgage insurance, which runs about 1 percent to 2 percent of your loan amount, will be tacked on to your monthly mortgage if you have less than 20 percent equity in your home. First-time homebuyers under certain income thresholds can get a loan through the Federal Housing Authority for as little as 3.5 percent down. FHA will insure mortgages made through FHA-approved lenders. FHA loan limits vary based by region. In the Bay Area and New York City, for example, the limit is $625,000 for single-family homes. Meanwhile, it is $271,050 for most counties in Alabama. However, not all sellers will want to accept an FHA offer, because they worry that the appraisal might take longer and the inspections will be more rigorous. "The truth is, if you go in with 20 percent down and a preapproval, you're going to get the home instead of someone with 3.5 percent down and FHA financing," Ferrari said. After the down payment, you'll still need to have cash on hand for closing costs, which typically run 1 percent to 3 percent of the purchase price. In addition to fees paid to the bank, you'll also need to pay for an inspection, property taxes and title insurance. Some lenders may roll up closing costs into your mortgage. Remember to budget for your move, too. Along with direct moving costs, you'll probably be running out to a hardware store every few days for something new to feather your nest with. Watch the taxes. The federal allowance for how much profit you can get without paying capital gains tax is pretty high — $250,000 for singles and $500,000 for couples. To walk away without paying the capital gains tax, you must have lived in the home two out of the last five years. But that doesn't mean you won't pay taxes on the sale of your home. Most states and municipalities also levy a transfer tax. In some parts of Nevada, where Rheinberger of the National Association of Realtors works, that amounts to just a few dollars per $1,000 of the sale price. But in the Bay Area, where Linnette Edwards is an associate broker with Better Homes & Gardens, it runs to $15 per $1,000. "On a million-dollar home, you're talking about $15,000," Edwards said. In New York City, there's also a mansion tax — 1 percent of the sale price of properties that sell over $1 million. Depending on the market, sellers might be able to negotiate this tax and get the buyer to shoulder some of this responsibility, said Edwards. But most of the time, this is the seller's responsibility. Timing is everything — hopefully. Then there are those times when you're both a buyer and a seller. Sometimes you get the timing down just right. But if not, you could end up owning two properties at once or having a gap between selling and buying. Contingency. If you're a seller in a hot market, you might have some leverage to push the closing date of the property you're selling to one that makes it convenient for you. Goodman, the New York City broker, tells of a Harlem townhouse whose owner needed six months to clear out a lifetime of papers and mementos. "The buyers weren't thrilled," he said. "But they got the property, even though they bid $40,000 less than someone because they were willing to wait." Bridge loan. When you have children and pets, not to mention piles of laundry lying around, it can be nearly impossible to make your home ready for showings at a moment's notice. Families, said Goodman, often prefer to sell their home after they've moved out. In this case, if you don't have the income to pay two mortgages at once, a bridge loan may be the answer. A bridge loan, also known as gap financing or interim financing, is a short-term loan — usually up to one year — that is backed by some form of real estate. Most borrowers take the bridge loan against their current property to finance the purchase of the new property. Interest rates are high, however. Expect to pay about two percentage points more for a bridge loan than a conventional mortgage.